Bioneer’s AccuPower® PCR PreMix is a convenient lyophilized PCR master mix containing Top DNA Polymerase, dNTPs, reaction buffer, tracking dye, and patented stabilizer. AccuPower® PreMix PCR master mix includes our super-processive “three times faster than Taq” Top DNA Polymerase for the fastest nucleic acid amplification. While Top DNA Polymerase is ideal for applications where you would normally use Taq, if your needs include HotStart PCR, or High Fidelity PCR, please see our AccuPower® HotStart PCR and AccuPower® TLA product pages. AccuPower® PreMix PCR master mix is available with or without tracking dye, depending on your application. If purchased with tracking dye, reactions can be loaded on agarose gels without adding loading buffer. Figure 1. 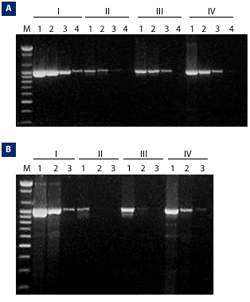 Processivity comparison with Lambda DNA template and different PCR reagents. Figure 2. Comparison of sensitivity test for AccuPower® PreMix PCR master mix and other companies' products using serial diluted human genomic DNA. Reaction condition: 95°C for 5 minutes, followed by 35 cycles of 20 seconds at 95°C, 20 seconds at 60°C, 30 seconds at 72°C.